"I do not say, my Lords, that the French will not come. I say only they will not come by sea." - John Jervis, Earl of St. Vincent, First Lord of the Admiralty, assured the House of Lords in 1801. But by January 1st, 1805 the Viscount Melville, the current First Lord of the Admiralty, must consider the irony of those words in light of recent events. Years have passed and a new threat of invasion looms large. Spain has declared war on England. French men-of-war are poised to rendezvuos with Spanish warships, putting together a Combined Fleet large enough to brush aside Melville's ships guarding the channel. Napoleon and his army of 200,000 men stand ready at Boulogne. The newly crowned Emperor of France has pledged, "Let us be masters of the Channel for six hours and we are masters of the world." Not since the days of the Spanish Armada has England faced a greater threat of seaborne invasion. Not since the reign of William the Conqueror has France the opportunity to invade and subjugate its ancient enemy. For the people of Britain, the threat of foreign boots on English soil is more real than it has been at any time in the last two centuries. 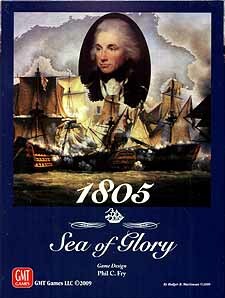 1805: Sea of Glory places you in command of the Royal Navy or the allied fleets of France and Spain. You direct your far flung forces, raid enemy ports, and bring your wooden warships into combat with the enemy. Key ports must be protected and enemy harbours blockaded. With a constant eye to wind and weather, your ships must cross the North Atlantic, the Mediterranean Sea, and the West Indies. Your opponent will not know the composition of your forces until combat is joined. The fog of war complicates every decision. The fate of nations will once again be determined by wooden ships and iron men. The cat and mouse game of breakout and pursuit has begun.